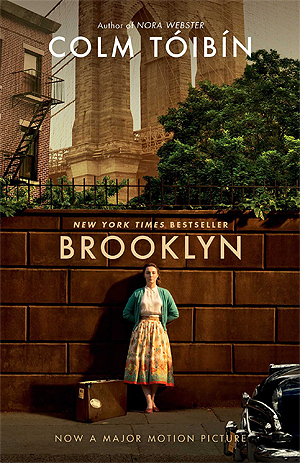 Given that the adapted screenplay of Colm Tóibín’s Brooklyn was up for an Oscar a few nights ago, today seemed like a good time to talk about the book (which I read over the Valentine’s Day weekend – perfect material, really!). The first thing you should know is that I read this book the wrong way ‘round. I had no intention of reading it at all (even though I had heard good things about it! ), but then I saw the film. I LOVED it to bits. A couple of months later I saw the movie tie-in edition while browsing at the bookstore and took it straight to the register for purchase. I then read it in a night and a morning – thank you, weekends! I liked this book a lot – almost as much as I loved the film. Oh, it was good! Eilis Lacey has come of age in small-town Ireland in the hard years following World War II. When an Irish priest from Brooklyn offers to sponsor Eilis in America, she decides she must go, leaving her fragile mother and her charismatic sister behind. 1. Making the setting feel alive. He imparted the small-town feel of Eilis’ hometown of Enniscorthy in a spare, funny way that matched the repression and busy-body behavior of its inhabitants. In the same way, he pulled the reader into the bustle and strangeness of Brooklyn, without employing florid prose. 2. Inhabiting Eilis’ character and inner life. Good people are often difficult to describe in 3D, but Tóibín does it. He brings Eilis’ quiet hopes and dreams to life without boring the reader. Eilis, though faced with many challenges, never seems acted upon – she is the hero of her own story. An aside: It is too seldom that I can say that about works written by men about female characters. 3. Suffusing words with emotion. Although, or perhaps in spite of, the way that his characters repress their feelings, Tóibín captures the culture and spirits of the time period he writes about. In parts, the language, the descriptions, the topics of conversation (and those seemingly forbidden), reminded me very strongly of old letters my grandfather wrote my mother while she was away at school – in the 50s. So perfectly capturing the vernacular and feel of the era is a feat. So far I haven’t said a thing about the plot, except to call Brooklyn a quiet book. And it is that, if you can call transatlantic voyages, falling in love, growing up and surviving tragedy quiet. It’s powerful, and beautiful, and though I usually prefer books with magic in them, I can tell you that this one is EXCELLENT. The best books make me laugh and cry. I had high hopes for Brooklyn because the movie did both of those things, in spades. And I wasn’t disappointed. Recommended for: anyone interested in books about strong women (not trying to be cliché here – just don’t know of a better way to say that! ), fans of literary fiction and romance, and YA readers who don’t mind the labels on their books, as long as they are romantic and historical. p.s. The film adaptation of Brooklyn = truly lovely. I’m not sure if I’ve ever seen a better book/film match (not saying that it’s a carbon copy – it’s not! )… just that Hornby rocked it and somehow transferred the exact feel of the book into film form. Ahhhhhh, I just don't know about this book! I have SUCH a hard time reading historical fiction set in America, even if it's excellent. But I TRUST you, so I will at least give the first few chapters a try. And see. Or I'll at least watch the film. Jenny, I think you'd like it, but I recommend seeing the film first (like I did). That really recommended the book to me, and I don't know how you could hate the film. I've bookmarked you page so I can come back and read it after I've read the book and/or seen the movie. Thanks so much!